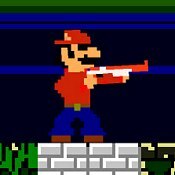 Description: In Gangster Bros you play as Mario armed with a classic NES gun. Shoot bad guys in your way dead. Kill everyone in your path. Mario does not have time for Goombas no more lol. Game Controls: W,A,S,D Keys = MOve. Use Mouse to Aim and Shoot!